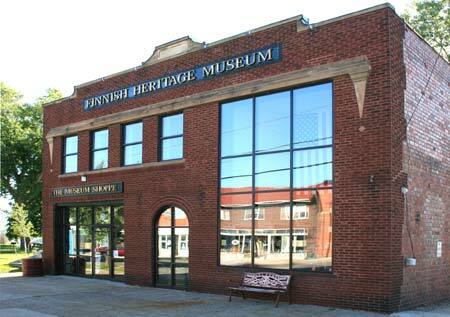 The Finnish Heritage Museum is dedicated to preserve and perpetuate the rich tradition of Finnish heritage and cultural traditions using displays of special books, documents, records and artifacts of Finnish life. The museum is located on the corner of High and Third Streets in downtown Fairport Harbor 2 blocks from Lake Erie and 1 block from the Finnish Monument. The building served the village for years in various public service capacities and until recently operated as the Fairport Harbor Senior Citizen's Center. The structure has had extensive repairs and remodeling in order to accommodate our museum exhibition galleries, library, workrooms and office areas.